Pre3Montes Playgroup environment provides a range of graduated activities that suit the unfolding developmental stages of children aged 0- 4, if your child is older than 4 please consider beginning them in our School in Cycle 1. Children can pursue tasks at their own pace and independently with just a little help from Mum or Dad. Careful understanding of the development of infants enables us to create a place that meets their needs. 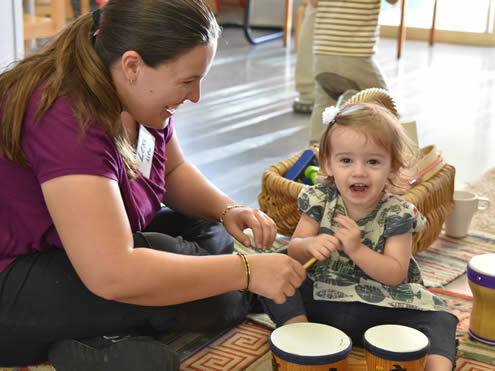 It is a parent-infant community facilitated by a Montessori Playgroup Leader where young children can engage in activities that assist their psychomotor skills, language acquisition, growing independence, and their understanding of the world. Prior to joining playgroup we would like you to do a 30 minute observation. An observation enables you to attend with your child to learn about how a Montessori playgroup operates. It allows you to determine if it is an environment that matches the goals and expectations you have for the early learning journey of your child. Want to know what is involved during a morning of playgroup? Please read our Pre3Montes Orientation Information. Our fees are $160 per term per child (siblings under 9 months of age attend free of charge). It is on average a ten week term with morning tea, craft, cooking etc. included in the price. A maximum of up to 2 makeup sessions can be provided due to sickness. Makeup sessions need to be booked with the Playgroup Coordinator. PlaygroupWA membership is required and is an annual fee per family. We will ask you to pay this when you first join us or you can provide us with your current membership details. Our Pre3Montes Program is run by a Facilitator. Our Facilitators have experience in the early childhood area of education and are there to help facilitate the interactions of parents with their children. They work closely with our College to seek a closer integration and interaction of the Playgroup with the School to provide an environment optimised to the developmental stages of young children.